The owner of a lot on Holbrook found out the hard away about trusting a contractor to get city-required permits. Let this be a cautionary tale for would-be developers. Last fall Noaman Nagi wanted to create a parking lot next-door to his building at 2396-2342 Conant. He was approached by a contractor who offered to do the job and take care of all necessary permits the city requires. Flash forward a few thousand dollars later and it turns out the contractor not only did a bad job, he did not bother to get the required permits. Not surprisingly, the work was done on a weekend, when city hall is closed and there is no way permits could have been issued. This is where Kathy Angerer, the city’s Director of Community & Economic Development, entered the picture. On the Monday after the work was completed she noticed the parking lot as she drove to city hall. She promptly put a stop to any further development to the site. She said it’s not uncommon that contractors deceive developers. 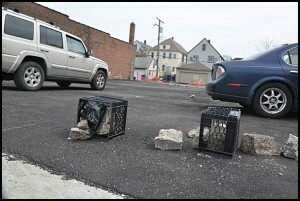 At a recent meeting of the city’s Plan Commission, which met to consider Nagi’s development plan (something Nagi failed to do in the first place), he was told there is a possibility that the parking lot will have to be torn up and replaced. Angerer told The Review in an email that there is no question the lot will be replaced. “The owner will proceed to tear out the existing asphalt and re-do the parking lot per the Plan Commission/Building Department approved specifications,” she said. Although Nagi is understandably frustrated, he wants to move forward. The contractor is long gone, and Nagi said it’s not worth spending money tracking him down and taking him to court. The lesson here is do your homework before undertaking a development, or you will likely end up spending twice as much. Umm… yeah right. We know the truth here.